Ashley Gerken goes up for a three-pointer over the tight defense of Alex Guadagno. The Dos Pueblos High girls’ basketball team converted three free throws in the final 30 seconds to stave off an inspired San Marcos comeback and capture a 27-21 Channel League victory on Thursday night at Maury Halleck Gymnasium. Sadie Subject led the way offensively for the Chargers with eight points, including two third-quarter three pointers that helped Dos Pueblos turn a 14-13 halftime lead into a 24-16 advantage going into the fourth quarter. San Marcos had its most offensive success in the first quarter. A steal and layup by Juliet Dodson gave the Royals an 8-5 lead with two minutes remaining in the opening period. Just before the first quarter buzzer sounded, Megan Cunnison followed with a deep two-pointer, which increased the San Marcos lead to 10-5. Back-to-back baskets by Subject and Mikayla Butzke cut the Dos Pueblos deficit to 10-9 midway through the second quarter, but Kiani Rojas responded with a three-pointer at 2:02 mark of the second quarter that gave San Marcos a 13-9 lead. From there Dos Pueblos staged a 13-1 run that was capped off by Subject’s second three-pointer with 4:48 remaining in the third quarter. San Marcos has failed to reach the 30-point mark over its last five games and the offensive struggles were once again evident against Dos Pueblos. Rojas finished with a team-high seven points and Dodson chipped in six points, but a consistent offensive threat never materialized. Dos Pueblos went scoreless in the fourth quarter until Butzke connected on a free throw with 28 seconds left that gave Dos Pueblos a 25-21 lead. 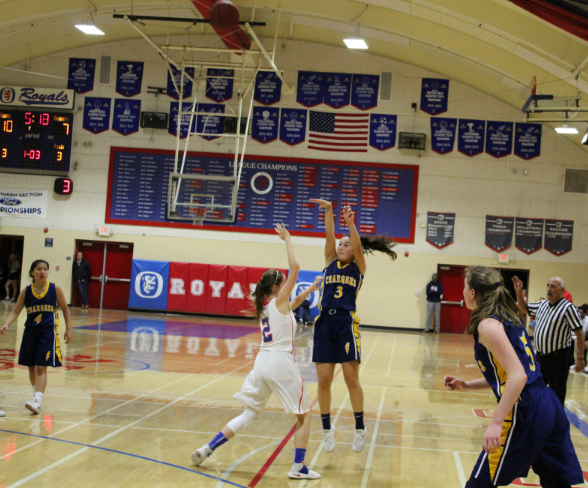 Butzke was key for Dos Pueblos inside as she grabbed a game-high nine rebounds. Dos Pueblos (11-9 overall, 1-3 Channel League) will travel to Cabrillo on Tuesday for another Channel League match. San Marcos (10-11, 2-2) will take on Santa Clara in Oxnard on Saturday before traveling to Santa Barbara for a crosstown rivalry game on Tuesday.